Roaches are a great dietary component for a variety of pet lizards. Though the very idea of dealing with feeder roaches causes many keepers to recoil, those that embrace roaches, have excellent results and rarely go back to crickets. While roaches aren't appropriate food for all pet lizards, monitors (Varanus sp. ), panther chameleons (Furcifer pardalis), bearded dragons (Pogona vitticeps) and leopard geckos (Eublepharis macularius) often relish them. Panther chameleons and a number of other chameleon species, readily eat roaches. Roaches provide another healthy component to the diet. While keepers should always seek out captive bred individuals for pets, in cases where this is not possible, roaches are often helpful in enticing wild-caught chameleons to eat. 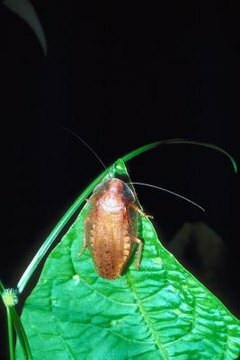 Though Madagascar hissing cockroaches are not the most popular species of roach for feeding, they do provide a chance to offer a truly native food source for panther chameleons or other Madagascan natives. Bearded dragons (Pogona vitticeps) are popular pet lizards, but they have one serious drawback: they can be very expensive to feed, given their insatiable appetites. This is a case where it makes sense to establish your own roach breeding colony. Some of the tropical species commonly used in the hobby include both the Madagascan hissing cockroach and the Dubia roach. As a rule of thumb, feed bearded dragons roaches that are about the same length as the span between the lizard's eyes. Being nocturnal, leopard geckos are natural predators of roaches. Dubia roaches in particular, are a wonderful food source for leopard geckos. While crickets may chew on the somewhat delicate skin of leopard geckos if left in the cage too long, roaches are not likely to bite your pet lizard. Juvenile leopard geckos should be fed five to ten small Dubia roaches a day, while adults can be fed twenty or more roaches at a time, three or four times per week. Due to the eventual size of even "dwarf" varieties, it is challenging to feed monitor lizards (Varanus sp.). While a three-foot long monitor may ignore even the largest crickets crawling around its cage, some roaches attain four inches or more in length, and will often draw the lizard's interest. Some monitors, like Emerald Tree Monitors (Varanus prasinus) consume roaches and other large insects off the trees, and are especially well served by a roach based diet.